PIGEON FORGE, Tenn. (February 2013) – Cowboy singers, cowboy poets and chuck wagon cooks are on the trail to Pigeon Forge for the 13th annual Saddle Up, Feb. 21-24, 2013. The four-day event, a tip of the hat to the American West, features concerts, a chuck wagon cookoff and other activities designed to entertain the entire family. Saddle Up helps wrap up Pigeon Forge Winterfest, a four-month season of activities that began last November. Cobbler is part of every lunch at Saddle Up’s chuck wagon cookoff. Performers for Saddle Up include cowboy poets Waddie Mitchell and Chris Isaacs, along with musicians Brenn Hill, the Quebe Sisters Band, Sourdough Slim, Dave Stamey, T. Scot Wilburn and the Shut Up -N- Playboys, and Wylie & the Wild West. There are theater concerts on Feb. 22 and 23 ($15) and two Intimate Evening dinner shows ($50) on Feb. 21. Wylie & the Wild West will perform after a four-course meal at the Partridge & Pear Restaurant, and the Quebe Sisters Band will entertain at Mama’s Farmhouse Restaurant following a family-style meal prepared by the Red River Ranch chuck wagon team from Texas. Stories & Strings ($15) is a special show on Feb. 22 at Smoky Mountain Guitars by a select group of Saddle Up musicians who will talk about personal musical influences and share favorite tunes and stories. Stories & Strings won a Pinnacle award from the International Festivals & Events Association. 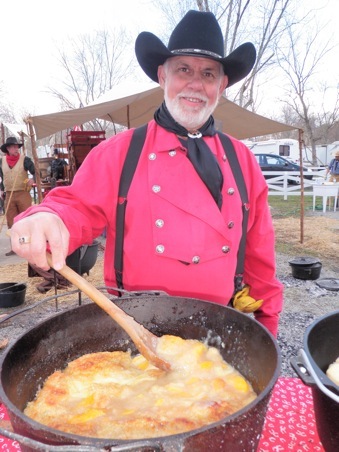 A chuck wagon cookoff, sponsored by Pigeon Forge Hospitality Association, is Feb. 23 at Clabough’s Campground. Chuck wagon cooks prepare lunch for guests and evaluation by a panel of judges. Lunch begins at noon, and tickets are $10. 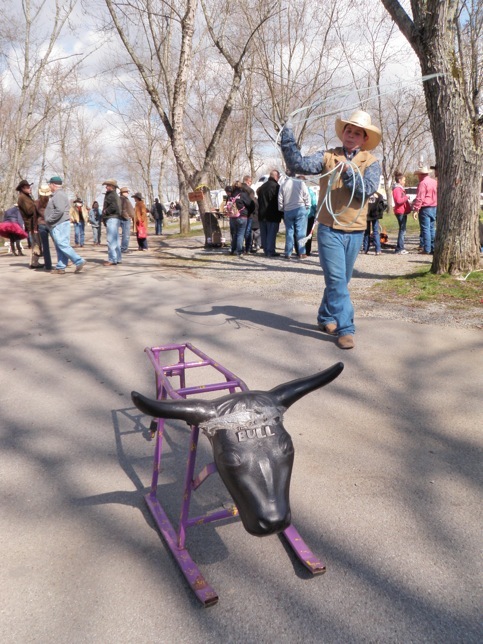 Learning to lasso is one activity at the Buckeroo Roundup. Buckeroo Roundup starts at 9 a.m. at the same location, offering a variety of free musical entertainment and cowboy-themed activities for family fun. A Cowboy Dance ($5) is Feb. 23 at Spirit of the Smokies Condo Lodge Ballroom. Cowboy Church, a non-denominational service at Stages West, is Feb. 24 at 10 a.m. It is preceded by a chuck wagon breakfast that begins at 8:30. Breakfast is $5; Cowboy Church is free. Saddle Up details are online at MyPigeonForge.com/saddleup.